The hosts are so enthusiastic that they can be a bit annoying at times, but apart from that their joy for pop culture is infectious. Ep 43: Avengers: Endgame Theories and Predictions w/ Dom Fera | Ant-Man is goin' WHERE??! Ep 42: Sorting Game of Thrones into Hogwarts Houses | THREE-EYED RAVENCLAW? Winter is HERE so Tessa and Brizzy are sorting the Houses and characters of Game of Thrones! Are Starks humble hardworking Hufflepuffs or noble do-gooder Gryffindors? Was Bran born to be a Ravenclaw or forced to become one? Is the Night King the best Ravenclaw villain ever? What does he even want?! Find out in this chilling episode where, sadly, all houses must die!<br><br>Follow us to stay up to date &amp; send us an owl:<br>TW: <a href="https://url.emailprotection.link/?bVO2q0UXR235wN_yOnM0FjlZ9h9YjzWbMYmEYTPV56QAiL5mtugvFraMFuzm09CEwDY7d7A0Qx70BimHUKMjKNQ~~">https://twitter.com/fantasticgeeks</a><br>FB: <a href="https://url.emailprotection.link/?bcWpEl4Gw352avFXBE8F6_D4ZAyeRAfbQt5lL7kJGDpPoM3gSxghbcFhbQHl1XctBR268q9EmCyyYZxIKlbsk8peSR3Uh76qLUXE4BUOLSlSkLLGOd2oTdoWlK5SxCaQM">https://www.facebook.com/groups/fantasticgeeks/</a><br>Email: <a href="mailto:fantasticgeekspod@gmail.com">fantasticgeekspod@gmail.com</a><br><br>Tessa:<br>IG: <a href="https://url.emailprotection.link/?bOBlK03OFRZ1-lvC8KC_psxL-nvvzLwZOytst1m2RHoub41pULpoIqNB3vweAh2_pY3VhjDfIM94NTCFg4kZIfapSoA5EhMeYIfT1he6lr_Cny2MpM6YEOLH4b151ZHfv">https://www.instagram.com/tessanetting/</a><br>TW: <a href="https://url.emailprotection.link/?bVO2q0UXR235wN_yOnM0FjkCpsA0m0tU7qxpio-kHVFffEWBsmRvpwO7R6lqJwf9ubu3TQaASbaztH1xsMqKnCQ~~">https://twitter.com/tessanetting</a><br>YT: <a href="https://url.emailprotection.link/?bH1bmLuRP-9egfczNVLB6hX7rnT-ETnhUE_1MJJue2479p5WvmX1b_7QzwKWpFQe4gJWQ3EYnsbxVNtN92XE2qQ~~">https://www.youtube.com/tessanetting</a><br><br>Anna:<br>IG: <a href="https://url.emailprotection.link/?bOBlK03OFRZ1-lvC8KC_psxbr6QZ2OzMcF46ucPVhzNePjghaz_t5xaoTtbvoOn-CcHuM6zvGDyRk96LyUZnTkNYu93CgfZeXSDNHdM-wkqB8YkohiJGdgBqpGUpJTwfD">https://www.instagram.com/brizzyvoices/</a><br>TW: <a href="https://url.emailprotection.link/?bVO2q0UXR235wN_yOnM0FjvNb7j9eCwXyDiYIYNUrO-rIH_RttGMQvA55tkgC-9BmcNSr19i3Hg5bIN2QE5P23Q~~">https://twitter.com/BrizzyVoices</a><br>YT: <a href="https://url.emailprotection.link/?bH1bmLuRP-9egfczNVLB6hSwXsmpk6MHI4QyGHL9dNvMrLbMMdmqCsWx7mgiVEpipc0tfdCwSM6lHuZJiN0znqQ~~">https://www.youtube.com/brizzyvoices</a><br><br>YOU are a Fantastic Geek! Ep 41: Pottermore Patronus Quiz (BREAKING IT DOWN) | Expecto Patro-WHAT??! Fantastic Geeks is COMIN’ BACK! Tis the season to celebrate ALL fandoms with Brizzy and Tessa in the PODCAST FINALE of Season 1! It’s time for ALL the Would You Rather, Kiss Marry Crucio, and Sorting characters submitted from you guys! Would they rather spend a night in the Forbidden Forest or a night in the Chamber of Secrets? Which Disney fox would they want to marry- Robin Hood, Todd, or Nick Wilde? How would they sort Mary Poppins, Garfield, Percy Jackson, or Charlie Brown? Join these geeks as they reminisce on this past season in this fantastic episode! Follow us to stay up to date &amp; send us an owl: TW: https://twitter.com/fantasticgeeks FB: https://www.facebook.com/groups/fantasticgeeks/ Email: fantasticgeekspod@gmail.com Tessa: IG: https://www.instagram.com/tessanetting/ TW: https://twitter.com/tessanetting YT: https://www.youtube.com/tessanetting Anna: IG: https://www.instagram.com/brizzyvoices/ TW: https://twitter.com/BrizzyVoices YT: https://www.youtube.com/brizzyvoices YOU are a Fantastic Geek! Tessa and Brizzy are joined this episode by YouTuber, weblebrity, educator, and now AUTHOR extraordinaire Hank Green. How did Harry Potter transform his experience on the internet? What Hogwarts houses are the characters from his new novel An Absolutely Remarkable Thing? How does one play a Sims game and NOT become unhealthily addicted? All of this and more is tackled in this absolutely remarkable episode! Keep up with Hank! TW: https://twitter.com/hankgreen IG: https://www.instagram.com/hankgreen/ YT: https://www.youtube.com/vlogbrothers https://www.youtube.com/user/hankschannel An Absolutely Remarkable Thing on Amazon: http://a.co/d/dtcoGd2 Go to https://www.burstoralcare.com and enter promo code GEEKS at checkout for 10% off your order! Follow us to stay up to date &amp; send us an owl: TW: https://twitter.com/fantasticgeeks FB: https://www.facebook.com/groups/fantasticgeeks/ Email: fantasticgeekspod@gmail.com Tessa: IG: https://www.instagram.com/tessanetting/ TW: https://twitter.com/tessanetting YT: https://www.youtube.com/tessanetting Anna: IG: https://www.instagram.com/brizzyvoices/ TW: https://twitter.com/BrizzyVoices YT: https://www.youtube.com/brizzyvoices YOU are a Fantastic Geek! Brizzy and Tessa go slightly mad as they focus in on one of the most mysterious characters in Fantastic Beasts: The Crimes of Grindelwald-- Credence Barebone!! Trying to uncover EVERYTHING there is to know about Credence after watching the new movie, they deep dive into all of the wild theories and possibilities they can imagine or have heard floating around the wizarding rumor mill. Get out your red thread and pin board because it’s time to join these Ravenclaws for a mind boggling episode! Go to https://www.burstoralcare.com and enter promo code GEEKS at checkout for 10% off your order! Follow us to stay up to date &amp; send us an owl: TW: https://twitter.com/fantasticgeeks FB: https://www.facebook.com/groups/fantasticgeeks/ Email: fantasticgeekspod@gmail.com Tessa: IG: https://www.instagram.com/tessanetting/ TW: https://twitter.com/tessanetting YT: https://www.youtube.com/tessanetting Anna: IG: https://www.instagram.com/brizzyvoices/ TW: https://twitter.com/BrizzyVoices YT: https://www.youtube.com/brizzyvoices YOU are a Fantastic Geek! In this spoiler-filled episode, Tessa and Brizzy are joined by Sarabeth to FINALLY open up about all of the details of Fantastic Beasts: The Crimes of Grindelwald! Who did what now? And WHAT does that mEEAAN? How could these things even be possible?? Opinions, reactions, and theories galore fill this jaw-dropping episode! Keep up with Sarabeth! IG: http://www.instagram.com/ohsarabeth Follow us to stay up to date &amp; send us an owl: TW: https://twitter.com/fantasticgeeks FB: https://www.facebook.com/groups/fantasticgeeks/ Email: fantasticgeekspod@gmail.com Tessa: IG: https://www.instagram.com/tessanetting/ TW: https://twitter.com/tessanetting YT: https://www.youtube.com/tessanetting Anna: IG: https://www.instagram.com/brizzyvoices/ TW: https://twitter.com/BrizzyVoices YT: https://www.youtube.com/brizzyvoices YOU are a Fantastic Geek! Tessa and Brizzy are joined by the YouTube theory masterminds that guessed that Maledictus is Nagini before anyone else- the SuperCarlinBrothers J and Ben! Does Fawkes have a connection to the Philosopher’s Stone? Could Newt’s Kelpie secretly be the Loch Ness Monster? WHO will turn to the dark side and join Grindelwald? All of this and more in this dark trip down a rabbit hole of anagrams…I mean podcast episode. Follow the SuperCarlinBrothers: YT: https://www.youtube.com/supercarlinbrothers J’s TW: https://twitter.com/jonkerlin Ben’s TW: https://twitter.com/SCB_Ben Follow us to stay up to date &amp; send us an owl: TW: https://twitter.com/fantasticgeeks FB: https://www.facebook.com/groups/fantasticgeeks/ Email: fantasticgeekspod@gmail.com Tessa: IG: https://www.instagram.com/tessanetting/ TW: https://twitter.com/tessanetting YT: https://www.youtube.com/tessanetting Anna: IG: https://www.instagram.com/brizzyvoices/ TW: https://twitter.com/BrizzyVoices YT: https://www.youtube.com/brizzyvoices YOU are a Fantastic Geek! Tessa and Brizzy are joined by none other than Hunger Games tribute and boss lady feminist extraordinaire Jacqueline Emerson! They talk Foxface, the dangers of the entertainment industry, the meaning of Potter and being an artist, and Hunger Games Hogwarts houses! All of this and more in this hunnngry episode! GO VOTE! Keep up with Jackie! Twitter: https://twitter.com/jackie_emerson Instagram: https://www.instagram.com/jackie_emerson/ Na Na Na (Na) Video: https://www.youtube.com/watch?v=LcSe1LVRq6Q Follow us to stay up to date &amp; send us an owl: TW: https://twitter.com/fantasticgeeks FB: https://www.facebook.com/groups/fantasticgeeks/ Email: fantasticgeekspod@gmail.com Tessa: IG: https://www.instagram.com/tessanetting/ TW: https://twitter.com/tessanetting YT: https://www.youtube.com/tessanetting Anna: IG: https://www.instagram.com/brizzyvoices/ TW: https://twitter.com/BrizzyVoices YT: https://www.youtube.com/brizzyvoices YOU are a Fantastic Geek! Ep 34: SUPERWHOLOCK | Supernatural, Doctor Who, &amp; Sherlock Tessa and Brizzy are joined by Brizzy's old roommate Alexis to breakdown the cult phenomenon that is SuperWhoLock: Supernatural, Doctor Who, and Sherlock. Why do so many people adore these television shows together? How does one possibly get caught up when there are so many seasons to binge? Would you rather kiss Moriarty, Lucifer, or a dalek? All of this and more is tackled in this NaturalDoctorSher-y episode! Follow Alexis! TW: https://twitter.com/Alexis_Goose IG: https://www.instagram.com/alexis_goose/ Follow us to stay up to date &amp; send us an owl: TW: https://twitter.com/fantasticgeeks FB: https://www.facebook.com/groups/fantasticgeeks/ Email: fantasticgeekspod@gmail.com Tessa: IG: https://www.instagram.com/tessanetting/ TW: https://twitter.com/tessanetting YT: https://www.youtube.com/tessanetting Anna: IG: https://www.instagram.com/brizzyvoices/ TW: https://twitter.com/BrizzyVoices YT: https://www.youtube.com/brizzyvoices YOU are a Fantastic Geek! Tessa and Brizzy are losing their wizard minds as they go through the third and FINAL Fantastic Beasts trailer! Why is there so much water and Raven imagery? What are these evil black cloths taking over Paris? What are their thoughts and feelings after seeing Dumbledore longing for Grindelwald in the Mirror of Erised and hearing the name…NAGINI!!??? JOIN US as we escape from MACUSA, take a portkey to Paris, and finally find Credence as we BREAK. IT. DOWN. Watch the trailer with us: https://www.youtube.com/watch?v=8bYBOVWLNIs Follow us to stay up to date &amp; send us an owl: TW: https://twitter.com/fantasticgeeks FB: https://www.facebook.com/groups/fantasticgeeks/ Email: fantasticgeekspod@gmail.com Tessa: IG: https://www.instagram.com/tessanetting/ TW: https://twitter.com/tessanetting YT: https://www.youtube.com/tessanetting Anna: IG: https://www.instagram.com/brizzyvoices/ TW: https://twitter.com/BrizzyVoices YT: https://www.youtube.com/brizzyvoices YOU are a Fantastic Geek! We. Are not. Okay. On the most incredible Wizarding World weekend trip of a lifetime in New York City, Tessa and Brizzy attended a Lumos Charity Gala hosted by J.K. Rowling, watched a special Lumos production of Cursed Child introduced by J.K. Rowling, and THEN spent a day hanging out with the cast of Fantastic Beasts, watching the final trailer a day early, and MEETING THE QUEEN J.K. FREAKING ROWLING HERSELF!!! Magical aesthetic goddess (and youtuber) Cherry Wallis joins Tessa and Brizzy to reminisce on all the magical details of this insane weekend! And a big thank you to Warner Bros for making the VIP Fan Event possible and to Lumos for the invite to the gala and Cursed Child show! Join us and listen to our memories that will create the strongest Patronus ever!!! Follow Cherry! IG: https://www.instagram.com/cherrywallis/ TW: https://www.twitter.com/cherrywallis YT: https://www.youtube.com/cherrywallis Listen to us on Dan Fogler's podcast: https://itunes.apple.com/us/podcast/season-3-ep-26-y-the-last-episode-almost-part-2/id1145191833?i=1000420385167&amp;mt=2 Follow us to stay up to date &amp; send us an owl: TW: https://twitter.com/fantasticgeeks FB: https://www.facebook.com/groups/fantasticgeeks/ Email: fantasticgeekspod@gmail.com Tessa: IG: https://www.instagram.com/tessanetting/ TW: https://twitter.com/tessanetting YT: https://www.youtube.com/tessanetting Anna: IG: https://www.instagram.com/brizzyvoices/ TW: https://twitter.com/BrizzyVoices YT: https://www.youtube.com/brizzyvoices YOU are a Fantastic Geek! Ep 31: Geeking Out w/ Dan Fogler | Jacob Kowalski’s NOT a Hufflepuff??! Tessa and Brizzy are joined by none other than Jacob Kowalski himself-- actor Dan Fogler! They talk Broadway, the miracle that was his Fantastic Beasts audition, Star Wars and Reylo, and the SECRETS Dan has about the upcoming Fantastic Beasts: The Crimes of Grindelwald!! Be sure to also go listen to Tessa and Brizzy’s guest episode of Dan’s podcast-- Season 3, Ep 26 of Dan Fogler’s 4d Experience! Keep up with Dan! Podcast: https://itunes.apple.com/us/podcast/dan-foglers-4d-xperience/id1145191833?mt=2 Twitter: https://twitter.com/mrdanfogler Instagram: https://www.instagram.com/danfogler/ Follow us to stay up to date &amp; send us an owl: TW: https://twitter.com/fantasticgeeks FB: https://www.facebook.com/groups/fantasticgeeks/ Email: fantasticgeekspod@gmail.com Tessa: IG: https://www.instagram.com/tessanetting/ TW: https://twitter.com/tessanetting YT: https://www.youtube.com/tessanetting Anna: IG: https://www.instagram.com/brizzyvoices/ TW: https://twitter.com/BrizzyVoices YT: https://www.youtube.com/brizzyvoices YOU are a Fantastic Geek! Ep 30: Roasting & Sorting Disney Princesses | Mulan has Cedric Quaking! Tessa and Brizzy get down to business to say something nice, something savage, and something sorty about the first seven Disney princesses! Why is Ariel so obsessed with Eric? Is Mulan the ultimate Gryff or the ultimate Puff? Why would Pocahontas pass on the absolute SNACK that is Kocoum??! All this and more in this royal episode! 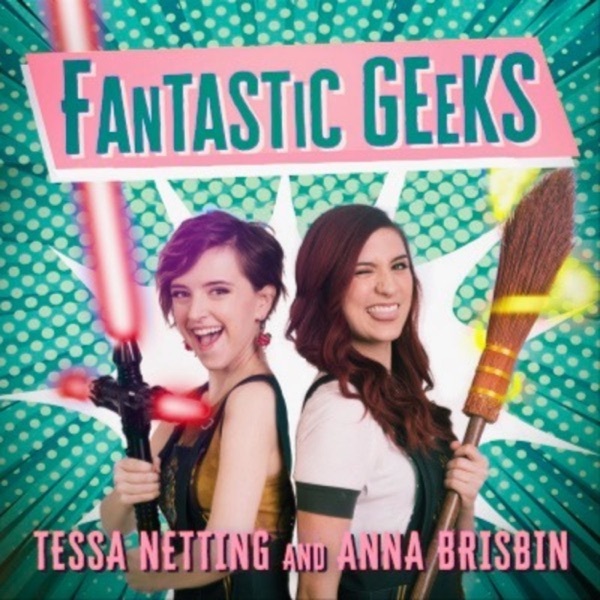 Follow us to stay up to date &amp; send us an owl: TW: https://twitter.com/fantasticgeeks FB: https://www.facebook.com/groups/fantasticgeeks/ Email: fantasticgeekspod@gmail.com Tessa: IG: https://www.instagram.com/tessanetting/ TW: https://twitter.com/tessanetting YT: https://www.youtube.com/tessanetting Anna: IG: https://www.instagram.com/brizzyvoices/ TW: https://twitter.com/BrizzyVoices YT: https://www.youtube.com/brizzyvoices YOU are a Fantastic Geek! Brizzy and Tessa rack their brains yet again and choose the top 5 books that have shaped them as humans, in both good ways and bad! From children’s stories to science fiction fairytales to young adult fiction to tales of spooky fantasy - THIS EPISODE HAS ‘EM ALL FOLKS. Join these Ravenclaws in discussion of their favorite stories in this book-centric episode! Follow us to stay up to date &amp; send us an owl: TW: https://twitter.com/fantasticgeeks FB: https://www.facebook.com/groups/fantasticgeeks/ Email: fantasticgeekspod@gmail.com Tessa: IG: https://www.instagram.com/tessanetting/ TW: https://twitter.com/tessanetting YT: https://www.youtube.com/tessanetting Anna: IG: https://www.instagram.com/brizzyvoices/ TW: https://twitter.com/BrizzyVoices YT: https://www.youtube.com/brizzyvoices YOU are a Fantastic Geek! Ep 28: Sorting Celebrities into Hogwarts Houses w/ Michaela Bryce | Is Justin Bieber in MY HOUSE? Break out the Sorting Hat! Michaela Bryce is BACK and helping Tessa and Brizzy sort famous celebrities that you suggested into Hogwarts houses! What house is Chris Pratt in? Which common room has The Rock taken over? And Taylor Swift is definitely a Slytherin…RIGHT?? Join our discussion in this very sorting special! And remember…fame isn’t everything, is it Mr. Potter? Follow us to stay up to date &amp; send us an owl: TW: https://twitter.com/fantasticgeeks FB: https://www.facebook.com/groups/fantasticgeeks/ Email: fantasticgeekspod@gmail.com Tessa: IG: https://www.instagram.com/tessanetting/ TW: https://twitter.com/tessanetting YT: https://www.youtube.com/tessanetting Anna: IG: https://www.instagram.com/brizzyvoices/ TW: https://twitter.com/BrizzyVoices YT: https://www.youtube.com/brizzyvoices YOU are a Fantastic Geek! SomeBODY once told me that Tessa and Brizzy have wanted to do a Shrek episode…well the fairytale creatures have spoken and the wait is FINALLY OGRE! Which character from Shrek would we want to marry? Is Donkey ACTUALLY a human? What are our favorite, most hilarious Shrek memes? If you’re an Allstar grab some waffles and JOIN US in this swamp-filled Shrektacular episode. It has a lot of layers. LIKE ONIONS. THIS EPISODE IS AN ONION. Follow us to stay up to date &amp; send us an owl: TW: https://twitter.com/fantasticgeeks FB: https://www.facebook.com/groups/fantasticgeeks/ Email: fantasticgeekspod@gmail.com Tessa: IG: https://www.instagram.com/tessanetting/ TW: https://twitter.com/tessanetting YT: https://www.youtube.com/tessanetting Anna: IG: https://www.instagram.com/brizzyvoices/ TW: https://twitter.com/BrizzyVoices YT: https://www.youtube.com/brizzyvoices YOU are a Fantastic Geek! Ep 26: Harry Potter Gender-Bent Casting! | Benedict Cumberbatch as McGonagall PLEASE!! Tessa and Brizzy are racking the actor catalogues of their brains to come up with the perfect gender-bent cast for the Harry Potter films. Who would be the perfect looney Luna Lovegood?? The most deliciously odious Dolores Umbridge? The gender-bent Drarry of Tessa's dreams? Nothing is more fun than reimagining the Harry Potter cast! Join our squees and fantasies in this mind-bending episode! Follow us to stay up to date &amp; send us an owl: TW: https://twitter.com/fantasticgeeks FB: https://www.facebook.com/groups/fantasticgeeks/ Email: fantasticgeekspod@gmail.com Tessa: IG: https://www.instagram.com/tessanetting/ TW: https://twitter.com/tessanetting YT: https://www.youtube.com/tessanetting Anna: IG: https://www.instagram.com/brizzyvoices/ TW: https://twitter.com/BrizzyVoices YT: https://www.youtube.com/brizzyvoices YOU are a Fantastic Geek! Brizzy and Tessa rack their brains and choose the top 5 films that have shaped them as humans, in both good ways and bad! Disney movies, Christmas movies, scary movies, musical movies, animated movies, Mary Kate and Ashley movies- THIS EPISODE HAS ‘EM ALL FOLKS. Join us in finding out our personal favorite films and then go have a movie marathon and watch them all! Follow us to stay up to date &amp; send us an owl: TW: https://twitter.com/fantasticgeeks FB: https://www.facebook.com/groups/fantasticgeeks/ Email: fantasticgeekspod@gmail.com Tessa: IG: https://www.instagram.com/tessanetting/ TW: https://twitter.com/tessanetting YT: https://www.youtube.com/tessanetting Anna: IG: https://www.instagram.com/brizzyvoices/ TW: https://twitter.com/BrizzyVoices YT: https://www.youtube.com/brizzyvoices YOU are a Fantastic Geek! Tessa and Brizzy hunker down to learn about the deepest darkest depths of their souls.... via nerdy buzzfeed quizes. What Game of Thrones house are they? Which Marvel character are they? What song from the Shrek original soundtrack describes THEIR LIVES?! All of this and more is at last discovered in this quiztastic episode! Which GoT group are you: https://www.buzzfeed.com/javiermoreno/a-quiz-is-coming Which Marvel character are you: https://www.buzzfeed.com/perpetua/marvel-cinematic-universe-character?utm_term=.biVZADG4v#.bcDzMVgWY Which Shrek song represents you: https://www.buzzfeed.com/hannahgcw/which-song-from-the-shrek-soundtrack-are-you-3b94k?utm_term=.yionwZ9lm#.wd7qywgd0 How long would you survive in the Hunger Games: https://www.buzzfeed.com/samstryker/i-volunteer-as-tribute?utm_term=.rwQBXbV75#.xb4qnkVRm Which Star Wars lady are you: https://www.buzzfeed.com/luisdelvalle/which-fierce-af-star-wars-lady-are-you Follow us to stay up to date &amp; send us an owl: TW: https://twitter.com/fantasticgeeks FB: https://www.facebook.com/groups/fantasticgeeks/ Email: fantasticgeekspod@gmail.com Tessa: IG: https://www.instagram.com/tessanetting/ TW: https://twitter.com/tessanetting YT: https://www.youtube.com/tessanetting Anna: IG: https://www.instagram.com/brizzyvoices/ TW: https://twitter.com/BrizzyVoices YT: https://www.youtube.com/brizzyvoices YOU are a Fantastic Geek! Ep. 23: Sorting Our Pets into Hogwarts Houses! | Do we match our animals?! Tessa and Brizzy find the most "official" pet sorting quizes the internet has to offer to sort their dog(s) and cat(s) into Hogwarts houses! What's their history with magical creatures? What are their DREAM pets? And what freakin house are Luna and Remus in?!?! All of this and more is covered in this fantastic beast of an episode! Take the quizes for your pets! Dogs: https://www.buzzfeed.com/alexandra949/what-hogwarts-house-does-your-dog-belong-in-1lus5?utm_term=.dn8bBKApx#.swRJNYPEd Cats:https://www.buzzfeed.com/expresident/hufflepurr?utm_term=.kkwO175G8#.ong7zoEmR Any Pets: https://www.hypable.com/hogwarts-house-pet-quiz/ FOLLOW OUR BABIES: Luna: https://www.instagram.com/white_luna_cat/ Remus: https://www.instagram.com/remus_the_doxie Follow us to stay up to date &amp; send us an owl: TW: https://twitter.com/fantasticgeeks FB: https://www.facebook.com/groups/fantasticgeeks/ Email: fantasticgeekspod@gmail.com Tessa: IG: https://www.instagram.com/tessanetting/ TW: https://twitter.com/tessanetting YT: https://www.youtube.com/tessanetting Anna: IG: https://www.instagram.com/brizzyvoices/ TW: https://twitter.com/BrizzyVoices YT: https://www.youtube.com/brizzyvoices YOU are a Fantastic Geek! Tessa and Brizzy are joined today by musical and comedic genius Malinda Kathleen Reese to talk all things Broadway! What are THE best Broadway shower songs? What's the beef between Billy Elliot and Shrek The Musical? Is Legally Blonde actually made for Slytherins? All of this and more will be addressed in this MUSICAL (but not actually) episode! FOLLOW MALINDA: TW: https://twitter.com/missmalindakat IG: https://www.instagram.com/missmalindakat YT: https://www.youtube.com/user/malineka146 Follow us to stay up to date &amp; send us an owl: TW: https://twitter.com/fantasticgeeks FB: https://www.facebook.com/groups/fantasticgeeks/ Email: fantasticgeekspod@gmail.com Tessa: IG: https://www.instagram.com/tessanetting/ TW: https://twitter.com/tessanetting YT: https://www.youtube.com/tessanetting Anna: IG: https://www.instagram.com/brizzyvoices/ TW: https://twitter.com/BrizzyVoices YT: https://www.youtube.com/brizzyvoices YOU are a Fantastic Geek! Ep 21: Fantastic Beasts: The Crimes of Grindelwald | COMIC CON TRAILER BREAK DOWN! This trailer is RIDDIKULUS! Tessa and Brizzy are taking Defense Against the Dark Arts with Dumbledore as they go through the new Fantastic Beasts trailer released at Comic Con! Why is evil magic cloth covering the buildings? What's up with that glowing skull?? Why are people in fedoras carrying coffins??! All of this and more is discussed in this beastly episode! Watch the trailer with us! https://www.youtube.com/watch?v=vvFybpmyB9E Follow us to stay up to date &amp; send us an owl: TW: https://twitter.com/fantasticgeeks FB: https://www.facebook.com/groups/fantasticgeeks/ Email: fantasticgeekspod@gmail.com Tessa: IG: https://www.instagram.com/tessanetting/ TW: https://twitter.com/tessanetting YT: https://www.youtube.com/tessanetting Anna: IG: https://www.instagram.com/brizzyvoices/ TW: https://twitter.com/BrizzyVoices YT: https://www.youtube.com/brizzyvoices YOU are a Fantastic Geek! Ep 20: The Lion King w/ Brian Hull | Mufasa is THICC! Tessa and Brizzy are joined by the talented and hilarious Brian Hull to go on a safari to the Pride Lands to talk everything THE LION KING! Will the live action remake be good? Is Scar the most successful Disney villain? What Hogwarts classes would Timon and Pumbaa teach??! All of this will be discussed (with some INSANE voice impressions sprinkled throughout!) in this wild episode! Hakuna Matata! Follow Brian! TW: https://twitter.com/BrianHullsVoice IG: https://www.instagram.com/brianhullsvoice YT: https://www.youtube.com/channel/UCiNeUoUWfBLC8mJuMzI6hvw Follow us to stay up to date &amp; send us an owl: TW: https://twitter.com/fantasticgeeks FB: https://www.facebook.com/groups/fantasticgeeks/ Email: fantasticgeekspod@gmail.com Tessa: IG: https://www.instagram.com/tessanetting/ TW: https://twitter.com/tessanetting YT: https://www.youtube.com/tessanetting Anna: IG: https://www.instagram.com/brizzyvoices/ TW: https://twitter.com/BrizzyVoices YT: https://www.youtube.com/brizzyvoices YOU are a Fantastic Geek! Ep 19: ADVICE for Potter Fans | What if your crush HATES Harry Potter??! Tessa and Brizzy offer their Ravenclaw wisdom to give you their BEST advice for all your Potter predicaments! What do you DO when you have no more books or movies left? How do you deal with being teased for your Hogwarts house? How do you convince someone to finally read Harry Potter? Come relate to all these struggles and more in this Ravenclaw riddle filled episode! Follow us to stay up to date &amp; send us an owl: TW: https://twitter.com/fantasticgeeks FB: https://www.facebook.com/groups/fantasticgeeks/ Email: fantasticgeekspod@gmail.com Tessa: IG: https://www.instagram.com/tessanetting/ TW: https://twitter.com/tessanetting YT: https://www.youtube.com/tessanetting Anna: IG: https://www.instagram.com/brizzyvoices/ TW: https://twitter.com/BrizzyVoices YT: https://www.youtube.com/brizzyvoices YOU are a Fantastic Geek! Ep 18: Harry Potter Books VS Movies w/ Lana | WHAT HAPPENED TO PEEVES??! Tessa and Brizzy are joined by Potter style icon Lana to compare the Potter BOOKS VS MOVIES! What is missing from the films? What scenes and characters matched PERFECTLY with the books? Who's the most book-accurate film actor? Why can't Dumbledore just take a chill pill and WHAT IS UP WITH THE GOBLET OF FIRE, Y'ALL?! All of this and more is covered in this episode made just for our fellow book obsessed Potterheads! Follow Lana! YT: https://www.youtube.com/lana IG: https://www.instagram.com/helloimlana TW: https://twitter.com/HelloImLana Follow us to stay up to date &amp; send us an owl: TW: https://twitter.com/fantasticgeeks FB: https://www.facebook.com/groups/fantasticgeeks/ Email: fantasticgeekspod@gmail.com Tessa: IG: https://www.instagram.com/tessanetting/ TW: https://twitter.com/tessanetting YT: https://www.youtube.com/tessanetting Anna: IG: https://www.instagram.com/brizzyvoices/ TW: https://twitter.com/BrizzyVoices YT: https://www.youtube.com/brizzyvoices YOU are a Fantastic Geek! Tessa and Brizzy battle it out in Part 2 of our Disney bracket show down to determine the BEST Disney movie of ALL TIME. Will Tessa get over her hatred of Aladdin? Can any Disney movie honestly beat The Lion King? WHICH DISNEY MOVIE WILL WIN?!?!! JOIN US as we crown our winner….just pretend movies can wear crowns okay SIMBA JUST WANTS TO BE KING. Click here to follow along and fill out the Disney bracket along with us (we are only doing the left half of the bracket in this episode): https://hypekids.com/2018/3/disney-pixar-march-madness-movie-bracket Follow us to stay up to date &amp; send us an owl: TW: https://twitter.com/fantasticgeeks FB: https://www.facebook.com/groups/fantasticgeeks/ Email: fantasticgeekspod@gmail.com Tessa: IG: https://www.instagram.com/tessanetting/ TW: https://twitter.com/tessanetting YT: https://www.youtube.com/tessanetting Anna: IG: https://www.instagram.com/brizzyvoices/ TW: https://twitter.com/BrizzyVoices YT: https://www.youtube.com/brizzyvoices YOU are a Fantastic Geek! Tessa and Brizzy, with YOUR help, debate through the Disney half of the popular Disney/Pixar bracket to decide which Disney movies are THE BEST. The Lion King v. Tarzan. Frozen v. Moana. Aladdin v. Hercules. The Little Mermaid v. Pocahontas….AND MORE! WHO WILL WIN?? Find out in this ultimate Disney movie show down! Click here to follow along and fill out the Disney bracket along with us (we are only doing the left half of the bracket in this episode): https://hypekids.com/2018/3/disney-pixar-march-madness-movie-bracket Follow us to stay up to date &amp; send us an owl: TW: https://twitter.com/fantasticgeeks FB: https://www.facebook.com/groups/fantasticgeeks/ Email: fantasticgeekspod@gmail.com Tessa: IG: https://www.instagram.com/tessanetting/ TW: https://twitter.com/tessanetting YT: https://www.youtube.com/tessanetting Anna: IG: https://www.instagram.com/brizzyvoices/ TW: https://twitter.com/BrizzyVoices YT: https://www.youtube.com/brizzyvoices YOU are a Fantastic Geek! Ep 15: Harry Potter and the Cursed Child w/ Michaela Bryce | Is it CANON? Tessa and Brizzy are not KEEPING THE SECRETS ANYMORRRE as they finally dish all of their opinions on the play Harry Potter and the Cursed Child. Why is Scorbus THE most obvious thing? How should time travel work in the wizarding world? What is up with that FREAKIN trolley lady??! Find out all of this and more in this cursed episode featuring the amazing Michaela Bryce! Our geekness is a-quivering! Find more Michaela! IG: https://www.instagram.com/michaelaabryce TW: https://twitter.com/MichaelaaBryce Follow us to stay up to date &amp; send us an owl: TW: https://twitter.com/fantasticgeeks FB: https://www.facebook.com/groups/fantasticgeeks/ Email: fantasticgeekspod@gmail.com Tessa: IG: https://www.instagram.com/tessanetting/ TW: https://twitter.com/tessanetting YT: https://www.youtube.com/tessanetting Anna: IG: https://www.instagram.com/brizzyvoices/ TW: https://twitter.com/BrizzyVoices YT: https://www.youtube.com/brizzyvoices YOU are a Fantastic Geek! Ep 14: Sorting Marvel Superheroes | THANOS...THE ULTIMATE HUFFLEPUFF?!?! Brizzy and Tessa hunker down to sort as many heroes &amp; villains of the Marvel Cinematic Universe as humanly possible. Do Captain America &amp; Iron Man clash because of their houses? Are Thor and Loki secretly Hogwarts founders? How do you sort characters who go on huge journeys and transformations??! Find out all this and more in this SUPER SORTING SPECTACULAR! Follow us to stay up to date &amp; send us an owl: TW: https://twitter.com/fantasticgeeks FB: https://www.facebook.com/groups/fantasticgeeks/ Email: fantasticgeekspod@gmail.com Tessa: IG: https://www.instagram.com/tessanetting/ TW: https://twitter.com/tessanetting YT: https://www.youtube.com/tessanetting Anna: IG: https://www.instagram.com/brizzyvoices/ TW: https://twitter.com/BrizzyVoices YT: https://www.youtube.com/brizzyvoices YOU are a Fantastic Geek! Tessa and Brizzy don't feel so good... after watching this FREAKING MOVIE!! Why did Starlord have to be SUCH a Gryffindor? Is Thanos the ultimate hero? What do we think happens NEXT?? Of all of Doctor Strange's 14,000,605 possibilities, you don't want to miss THIS ONE! Follow us to stay up to date &amp; send us an owl: TW: https://twitter.com/fantasticgeeks FB: https://www.facebook.com/groups/fantasticgeeks/ Email: fantasticgeekspod@gmail.com Tessa: IG: https://www.instagram.com/tessanetting/ TW: https://twitter.com/tessanetting YT: https://www.youtube.com/tessanetting Anna: IG: https://www.instagram.com/brizzyvoices/ TW: https://twitter.com/BrizzyVoices YT: https://www.youtube.com/brizzyvoices YOU are a Fantastic Geek! Tessa and Brizzy take the FULL Pottermore Ilvermorny House Sorting Quiz together with ALL the questions, breaking down and talking through each one, while they discover their Ilvermorny house percentages once and for ALL. Are they more Thunderbird, Pukwudgie, Wampus, or Horned Serpent? Would they rather choose the more noble or selfish answer? What would they exchange for their deepest heart’s desire? It’s getting deep y’all. Also, Brizzy hates her house and Tessa literally gets a different house than she normally does so it’s TIME FOR ANOTHER IDENTITY CRISIS. JOIN US YOU NO-MAJ. Click here to take the full Pottermore Ilvermorny Sorting Quiz along with us:http://www.gotoquiz.com/complete_pottermore_ilvermorny_sorting Follow us to stay up to date &amp; send us an owl: TW: https://twitter.com/fantasticgeeks FB: https://www.facebook.com/groups/fantasticgeeks/ Email: fantasticgeekspod@gmail.com Tessa: IG: https://www.instagram.com/tessanetting/ TW: https://twitter.com/tessanetting YT: https://www.youtube.com/tessanetting Anna: IG: https://www.instagram.com/brizzyvoices/ TW: https://twitter.com/BrizzyVoices YT: https://www.youtube.com/brizzyvoices YOU are a Fantastic Geek! Ep 11: Rugrats | Is Tommy Pickles secretly the Doctor? Hold on to your diapies, babies, we're goin in! Tessa and Brizzy reminisce on the ultimate 90s nicktoon Rugrats! Did Angelica inspire Tessa's character Hazel in BUNK'D? Was All Grown Up good? Are all the babies ACTUALLY DEAD??! Find out in the bestest episode yet! Follow us to stay up to date &amp; send us an owl: TW: https://twitter.com/fantasticgeeks FB: https://www.facebook.com/groups/fantasticgeeks/ Email: fantasticgeekspod@gmail.com Tessa: IG: https://www.instagram.com/tessanetting/ TW: https://twitter.com/tessanetting YT: https://www.youtube.com/tessanetting Anna: IG: https://www.instagram.com/brizzyvoices/ TW: https://twitter.com/BrizzyVoices YT: https://www.youtube.com/brizzyvoices YOU are a Fantastic Geek! Ep 10: FAIRLY ODDPARENTS w/ Butch Hartman | Timmy Turner's a Slytherin?! Tessa and Brizzy are joined today by animation legend Butch Hartman (creator of Nickelodeon classics like Fairly Odd Parents, Danny Phantom, and more!) to chat about the magic behind his cartoons! What are Timmy’s parents names? How does Butch feel about Harry Potter? Between Tessa and Brizzy - who’s the Cosmo and who’s the Wanda? Get your Crocker conspiracy theories ready and find out in this fairly odd episode all about FAIRIESSSSSSS!!!!! Support the show and step up your audiobook game by signing up for a free trial of Audible! http://www.audible.com/geeks Keep up with Butch! Speech Bubble Podcast: https://itunes.apple.com/us/podcast/speech-bubble/id1292425421?mt=2 The Noog Network App: https://itunes.apple.com/us/app/the-noog-network/id1000772961?mt=8 YT: https://www.youtube.com/butchhartman TW: https://twitter.com/realhartman IG: https://www.instagram.com/butchhartman/ Follow us to stay up to date &amp; send us an owl: TW: https://twitter.com/fantasticgeeks FB: https://www.facebook.com/groups/fantasticgeeks/ Email: fantasticgeekspod@gmail.com Tessa: IG: https://www.instagram.com/tessanetting/ TW: https://twitter.com/tessanetting YT: https://www.youtube.com/tessanetting Anna: IG: https://www.instagram.com/brizzyvoices/ TW: https://twitter.com/BrizzyVoices YT: https://www.youtube.com/brizzyvoices YOU are a Fantastic Geek! Ep 9: Doctor Who The Ninth Doctor | Luna Lovegood = BEST Companion! Brizzy and Tessa travel through time to talk all about Doctor Who, specifically the Ninth Doctor played by Christopher Eccleston. What character from another fandom would be the perfect companion for the Doctor? Would Brizzy and Tessa rather travel to 1869 Cardiff to fight zombies or the end of the world to dance to Toxic? Is Nine a Gryffindor or a Slytherin? Find out in this FANTASTIC episode! And remember: DON’T. SKIP. NINE!!! Follow us to stay up to date &amp; send us an owl: TW: https://twitter.com/fantasticgeeks FB: https://www.facebook.com/groups/fantasticgeeks/ Email: fantasticgeekspod@gmail.com Tessa: IG: https://www.instagram.com/tessanetting/ TW: https://twitter.com/tessanetting YT: https://www.youtube.com/tessanetting Anna: IG: https://www.instagram.com/brizzyvoices/ TW: https://twitter.com/BrizzyVoices YT: https://www.youtube.com/brizzyvoices YOU are a Fantastic Geek! Tessa and Brizzy jump into hyperspace to discuss Star Wars: The Last Jedi with Joe Moses! What is Snoke's REAL fate? Is Reylo a tale as old as time? And between Joe and Brizzy-- who can do a better Porg impression?? Find out all this and more in this intergalactic episode! Find Joe Moses! IG: https://www.instagram.com/thejoemoses TW: https://twitter.com/thejoemoses Follow us to stay up to date &amp; send us an owl: TW: https://twitter.com/fantasticgeeks FB: https://www.facebook.com/groups/fantasticgeeks/ Email: fantasticgeekspod@gmail.com Tessa: IG: https://www.instagram.com/tessanetting/ TW: https://twitter.com/tessanetting YT: https://www.youtube.com/tessanetting Anna: IG: https://www.instagram.com/brizzyvoices/ TW: https://twitter.com/BrizzyVoices YT: https://www.youtube.com/brizzyvoices YOU are a Fantastic Geek! Ep 7: Pottermore Hogwarts Sorting Quiz (BREAKING IT DOWN) | Are we STILL in Ravenclaw?? Tessa and Brizzy take the FULL Pottermore Hogwarts House Sorting Quiz together with ALL the questions, breaking down and talking through each one, while they discover their Hogwarts house percentages once and for all!! Which road tempts them the most? Would they rather drink a chocolate plum smoothie or a glass of liquid sunshine? After all this time is Ravenclaw STILL their #1 house? Find out in this quizzical episode!! IT’S TIME FOR AN IDENTITY CRISIS. Click here to take the full Pottermore Hogwarts House Sorting Quiz along with us: http://www.gotoquiz.com/pottermore_sorting_quiz_all_possible_question Follow us to stay up to date &amp; send us an owl: TW: https://twitter.com/fantasticgeeks FB: https://www.facebook.com/groups/fantasticgeeks/ Email: fantasticgeekspod@gmail.com Tessa: IG: https://www.instagram.com/tessanetting/ TW: https://twitter.com/tessanetting YT: https://www.youtube.com/tessanetting Anna: IG: https://www.instagram.com/brizzyvoices/ TW: https://twitter.com/BrizzyVoices YT: https://www.youtube.com/brizzyvoices YOU are a Fantastic Geek! Ep 6: The Avengers | Kiss Marry CRUCIO Chris Pratt, Chris Evans, or Chris Hemsworth? Tessa and Brizzy Hulk SMASH into the Marvel Cinematic Universe to talk all things Avengers! Why does Brizzy love Ant-Man but Tessa hates Captain America? Why would Spider-Man be our BFF? Which Infinity Stone is the ULTIMATE TIMETURNER? Throw on your cape and get ready for this ACTION PACKED episode! Follow us to stay up to date &amp; send us an owl: TW: https://twitter.com/fantasticgeeks FB: https://www.facebook.com/groups/fantasticgeeks/ Email: fantasticgeekspod@gmail.com Tessa: IG: https://www.instagram.com/tessanetting/ TW: https://twitter.com/tessanetting YT: https://www.youtube.com/tessanetting Anna: IG: https://www.instagram.com/brizzyvoices/ TW: https://twitter.com/BrizzyVoices YT: https://www.youtube.com/brizzyvoices YOU are a Fantastic Geek! Tessa and Brizzy apparate into Hogwarts and discuss the Crimes of Grindelwald teaser trailer and theories: Is Maledictus ACTUALLY Nagini? Credence is related to WHOM? Are we Team Dumbledore or Team Grindelwald and does their represented romance matter to the series? Grab your wand, pull up a chair, and LET’S BREAK IT DOWN. Follow us to stay up to date &amp; send us an owl: TW: https://twitter.com/fantasticgeeks FB: https://www.facebook.com/groups/fantasticgeeks/ Email: fantasticgeekspod@gmail.com Tessa: IG: https://www.instagram.com/tessanetting/ TW: https://twitter.com/tessanetting YT: https://www.youtube.com/tessanetting Anna: IG: https://www.instagram.com/brizzyvoices/ TW: https://twitter.com/BrizzyVoices YT: https://www.youtube.com/brizzyvoices YOU are a Fantastic Geek! Tessa and Brizzy dive into Newt's case to talk all about Fantastic Beasts and Where To Find Them! Is it better than the Potter films? Why is Newt being a Hufflepuff SO IMPORTANT? Can you guess which fantastic beast Brizzy is impersonating? All this and more to be answered in this FANTASTIC episode!! Follow us to stay up to date &amp; send us an owl: TW: https://twitter.com/fantasticgeeks FB: https://www.facebook.com/groups/fantasticgeeks/ Email: fantasticgeekspod@gmail.com Tessa: IG: https://www.instagram.com/tessanetting/ TW: https://twitter.com/tessanetting YT: https://www.youtube.com/tessanetting Anna: IG: https://www.instagram.com/brizzyvoices/ TW: https://twitter.com/BrizzyVoices YT: https://www.youtube.com/brizzyvoices YOU are a Fantastic Geek! Tessa and Brizzy dive into the UPSIDEDOWN to get deep in Stranger Things 1 and 2! Why is Steve the BEST? Will douchebag Billy ever be redeemed? What was the STRANGEST Thing?! Find out in this straaaange episode! JUSTICE FOR BARB! Follow us to stay up to date &amp; send us an owl: TW: https://twitter.com/fantasticgeeks FB: https://www.facebook.com/groups/fantasticgeeks/ Email: fantasticgeekspod@gmail.com Tessa: IG: https://www.instagram.com/tessanetting/ TW: https://twitter.com/tessanetting YT: https://www.youtube.com/tessanetting Anna: IG: https://www.instagram.com/brizzyvoices/ TW: https://twitter.com/BrizzyVoices YT: https://www.youtube.com/brizzyvoices YOU are a Fantastic Geek! Anna and Tessa are joined by actress and Disney Bounder Tiffany Sutton to chat Black Panther! Why is the film so important? How is T'Challa EXACTLY like Harry Potter? Is Okoye a Gryffindor or Ravenclaw? Find out all that and more in this juicy episode! Subscribe to the pod for new nerdy episodes EVERY FRIDAY! Keep up with Tiffany's amazing Disney adventures! Tiffany's IG: https://www.instagram.com/followtheyellowbrickgirl/ Tiffany's TW: https://twitter.com/TiffanyLanaeS Follow us to stay up to date &amp; send us an owl: TW: https://twitter.com/fantasticgeeks FB: https://www.facebook.com/groups/fantasticgeeks/ Email: fantasticgeekspod@gmail.com Tessa: IG: https://www.instagram.com/tessanetting/ TW: https://twitter.com/tessanetting YT: https://www.youtube.com/tessanetting Anna: IG: https://www.instagram.com/brizzyvoices/ TW: https://twitter.com/BrizzyVoices YT: https://www.youtube.com/brizzyvoices YOU are a Fantastic Geek! Fantastic Geeks (and where to find them) launches March 9th!